There are currently three airports in Berlin, the capital city of the Federal Republic of Germany, which together serve to provide air traffic for the capital and surrounding region. Tegel Airport (TXL), is in the north-west of the capital and located about 6 km or 4 miles from the western part of the inner city. The shortest connection to the underground network is provided by the bus services 109 and 128 from the underground stations Kurt-Schumacher Platz (U6) or Jakob-Kaiser Platz (U7). There is also a connection to the S and U-Bahn network at Jungfernheide (S4/U7). Besides the regular bus services, the X9 bus provides a link to the X9 from Bahnhof Zoo to Tegel. The Express Bus TXL serves the inner city region at 10 minute intervals, only stopping at a few major stops. Berlin Schoenefeld Airport (SXF) is located about 25 km or 15 miles south of the eastern inner city and is linked to the city by the S-Bahn services S45 and S9 and by regional trains RE4, RE5 and RB24. The airport express (RE4 and RE5) runs at 30 minute intervals from Bahnhof Zoo. There are also numerous bus services going to Schoenefeld airport: routes 160, 163, 171, 602, 735, 736, 737, 738, N46 and N 60. Berlin-Brandenburg International Airport will be the new Berlin airport in the German capital, Berlin. It airport is due to open some time after 2015. 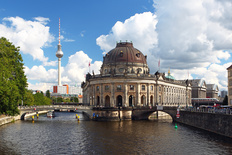 Due to its central location in Central Europe, Berlin airport is conveniently located for flights to important European airports including Eastern Europe, as well as long-haul intercontinental flights. Berlin Brandenburg Airport will be the third largest airport in Germany behind Frankfurt and Munich and an important hub for Lufthansa, airberlin, Germania and Germanwings. The airport will also be served by a number of low-cost airlines operating cheap flights such as Easyjet and Ryanair with flights to London amongst the busiest routes. The most modern airport on the European continent will be named after the former politician and mayor of Berlin, Willy Brandt. airport exit off the A113 motorway and the national road B-96a. Yes, paid parking. 1000 spaces in 4 short stay and long stay car parks.